Although fall isn’t typically a time of year when people worry about their air conditioning, it’s a great time to consider upgrading from your old unit. If your air conditioner gave you lots of trouble this year, it’s a good idea to upgrade. If you need quality air conditioning service in Broomall, PA, then you should employ our team here at Murphy’s Plumbing, Heating & Air Conditioning. Our technicians are always knowledgeable, conscientious, and prepared to answer any questions you might have about the process. You might know there’s something off about your air conditioner but not know the concrete signs that you need to replace your unit. If you’re experiencing any of the issues listed below, it’s probably a good idea to replace your unit sooner than later. If you feel like you have a laundry list of repairs to perform every summer, it’s probably time to replace your unit. Frequent repairs mean that your system is functioning past its prime. Although the price of a new unit is daunting, it’s more cost-effective to simply buy a new unit than to continually spend money on repairs. If you turn on your air conditioning and you’re met with warm air, you can benefit from a new air conditioning system. An air conditioning system with low cooling power means that your air conditioning system is deteriorating. If you’re experiencing low cooling power alongside low airflow, then that means there is typically a multitude of problems with your system. A lack of airflow is the most noticeable problem with your air conditioning and it needs prompt addressing. If you had high energy bills this summer but no drastic changes in your cooling habits, it’s likely due to inefficiency. To be certain that this is the cause, compare an energy bill from this summer and an energy bill from the last few summers. If you notice that there’s a drastic increase from one summer to the next it’s because your system is struggling to perform. This struggle for adequate performance means that your system is working harder but still only delivering merely adequate levels of cooling. A new unit with proper insulation ensures efficiency. If you start shopping for a new air conditioning unit now, you can take as much time as you need to when you’re shopping around. Our knowledgeable staff can even aid you in this process. 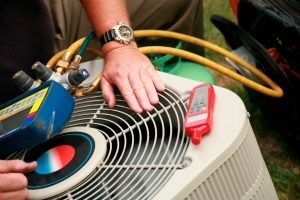 At Murphy’s Plumbing, Heating & Air Conditioning, we work with the best brands and understand how to match the right air conditioner to your home. Getting this process done early also allows you to take the time to save your money for the right system and allocate your funds wisely. Often, when homeowners feel that they’re under a time crunch, they try to cut corners on installation, but keep in mind that your unit is only as good as the service it receives. You should always have a responsible team that you trust to install your system. If you’re thinking of upgrading your air conditioning, we’ll help you through the process. Contact us to schedule an appointment today.